Discussion in 'Rate My Team' started by チャンピオンワタル, Oct 16, 2016. "Familiar to us are the two great heavenly bodies that watch over us, but even more familiar to us is the very planet on which we stand. Drawing power from the radiant Sun during the day, as well as the mysterious Moon in the night, this earthly sphere which we call home is the most direct source of life. From the oxygen contained within its atmosphere, to the water that fills this planet, and the fertile grounds on which agriculture is made possible, all of that which this land enables is truly a wonder to behold. Regarded as a necessary product of an infinitely large universe by some, the work of a deity according to others, and revered as a sacred gift from their spiritual ancestors by certain groups, the land however is not as benevolent as many may believe. Exploiting every living being's dependence on it, the ease with which it punishes those who overuse its resources is remarkable. From simple movements of its surface to the ejection of the magma flowing within its interior, the planet is itself a dangerous weapon, whose very destructive power this team utilizes in order to smite all that stand in its way!" Greetings, people of Pokémon Online. I am but one of the countless Pokémon trainers in the world. Yet, one as I may be, I am and have been known by a myriad of names throughout different eras across my Pokémon career. However, as much as the name by which anyone calls me may vary, one fact about me remains constant and unarguable: I am the single Greatest Pokémon Master to have ever walked this Earth. Between Generation V and Generation VI, I have reached #1 on fifty different ladders across ten different servers and seventeen different metagames (BW1 DW Ubers, BW2 No Preview Ubers, BW2 Wifi Ubers, Pure BW2, Global Showdown, BW2 Balanced Hackmons, XY Ubers, PokeBattle's 1000 PBV tier, XY Balanced Hackmons, Almost Any Ability, 350 Cup, ORAS Ubers, Anything Goes, Inheritance, No Preview Anything Goes, ORAS Balanced Hackmons (on Pokémon Online, without an EV limit), Inverted Balanced Hackmons, and finally, ORAS Classic Hackmons) throughout Pokémon Online, Pokémon Showdown! and PokeBattle. 4. The DW Ubers ladder on the old Pokémon Online's Pokémon México server, under the name "[DR] The Champion"
6. The No Preview Ubers ladder on the Pokémon Online's Pokémon Online server, under the name "Tr4nsc3nd3nt R0ck3r"
7. The DW Ubers ladder on the Pokémon Online's Pokémon México server, under the name "Tr4nsc3nd3nt R0ck3r"
9. The Ubers ladder on the Pokémon Online's Reborn server, under the name "Tr4nsc3nd3nt R0ck3r"
12. The Ubers ladder on Pokémon Showdown! 's Smogon University server just prior to the OHKO Clause test, under the name "FinalEliteMaster"
14. The Uberssuspecttest ladder on Pokémon Showdown! 's Smogon University server, during the OHKO Clause test, under the name "1337 Champion"
17. The 无规则 ladder on Pokémon Online's 口袋吧官方服务器2.0 server, under the name "Without Heavens"
18. The Uberssuspecttest ladder on Pokémon Showdown! 's Smogon University server, during the Sleep Clause test, under the name "Warlock PAUNCHER"
23 The Gen 6 Ubers ladder on Pokémon Online's Gen 6 Beta server, under the name "DracoMaster|ワタル"
25. The XY Ubers ladder on Pokémon Online's Pokémon Brasil server, under the name "DracoMaster|ワタル"
26. The ubers ladder on Pokémon Showdown! 's Smogon University server, under the name "Ace of Spades 1337"
29. The Uberssuspecttest ladder on Pokémon Showdown! 's Smogon University server during the Gengarite suspect test, under the name "KYAPUTEN FARUKON"
30. The XY Ubers ladder on the Pokémon Online server after the Geomancy Test Ban ladder reset, under the name "【天龍神】 ワタル"
33. The 350 Cup ladder on Pokémon Showdown! 's Smogon University server, under the name "LLW【天龍神】"
34. The ORAS Ubers ladder on Pokémon Online's Pokémon Online server, under the name "【天龍神】 ワタル"
36. The Inheritance ladder on Pokémon Showdown! 's Smogon University server, under the name "1337 Champion"
39. Another Anything Goes ladder on Pokémon Showdown! 's Smogon University server, under the name "MirajaneSatanSoul"
40. Another XY Ubers ladder on Pokémon Online's Pokémon Online server, under the name "【天龍神】 Eclipse"
41. Another ORAS Balanced Hackmons ladder on Pokémon Online's Pokémon Online server, under the name "【天龍神】 Eclipse"
42. Another Anything Goes ladder on Pokémon Online's Pokémon Online server, under the name "【天龍神】 Eclipse"
46. The ORAS Hackmons ladder on Pokémon Online's Pokémon Online server, under the name "【天龍神】 ワタル"
47. The current ORAS Balanced Hackmons ladder on Pokémon Online's Pokémon Online server, under the name "【天龍神】 ワタル"
48. The current Anything Goes ladder on Pokémon Online's Pokémon Online server, under the name "【天龍神】 ワタル"
49. The current ORAS Ubers ladder on Pokémon Online's Pokémon Online server, under the name "【天龍神】 ワタル"
50. The ORAS Ubers ladder on Pokémon Showdown! 's Smogon University server, under the name "NightmaresMassacre"
I would also like to mention that I may have reached #1 using multiple names at different points in time on some of the above ladders. For example, on the very same ladder on which I have reached #1 using the name "Holy One", I was also #1 under the name "Th3 R0ck3r" at one point, as well as #1 under the name "Butterfly Aizen" at one point. But I did not mention those instances in which I have been #1 separately, as they do not count as a "new" ladder on which I have reached #1, since I have already occupied that position on the ladder under a different name before. You may have also noticed that fifteen of the above ladder peaks have been italicized, with a red asterisk at the end of them. Those are what I would personally consider to be the greatest of all of my ladder peaks, for various reasons such as the incredible length of time I held on to the #1 position on that ladder, the huge number of points by which I outclassed the person who was #2 on that ladder, the sheer number of names I have high up on that ladder simultaneously, the sheer difficulty of that ladder itself due to the skill of the other trainers battling on it, or a combination of the aforementioned. In my two previous Rate My Team threads, The Master of the Universe [Transcendent Being of Power Mix] and The Master of the Universe [Immanent Being of Thought Mix], I did state that those were going to be my final Rate My Team threads for Generation VI. However, I changed my mind, for two reasons. Firstly, for reasons that I do not intend to reveal, there is a chance that this may be my final Rate My Team thread ever, at least under the identity of LANCE. But of course, I will not say that this will definitely be the case, for the same reason why I have never, at any point in my life, declared that I would be leaving Pokémon, despite having felt like doing exactly that innumerable times in the past. I cannot predict what I may want or feel like doing in the future, so if I declared that I would be leaving Pokémon, or stated that a certain thing that I did would be the last in my life, I would simply be limiting my own options in the future. I am certain that the countless people who have stated that they were leaving Pokémon, and made goodbye threads on the Smogon or Pokémon Online forums only to return later understand exactly what I am talking about here. However, because there is a chance that I may be prevented from making more Rate My Team threads under this current identity of mine, I feel that I should take this opportunity to make one now that Generation VI has come to a close. Secondly... the Greatest Pokémon Master I may be, but exactly who am I, more specifically? People have all heard numerous legends about me: DracoMaster|LANCE, Leader of the short-lived, yet glorious, albeit controversial Dragon Masters clan. PTR, the troll who singlehandedly fought a grand war against the authority figures in Pokémon Showdown! 's Ubers room. Heavenly Dragon Gods Leader, and author of A Guide To Ethics. The world of competitive Pokémon may regard any, several, or all of the aforementioned descriptions as my identity, but what defines me when I am doing what I am best known for - participating in Pokémon battles? Am I Master of DaUniverse, the kid who was famous for spamming Übers (or, more appropriately for the time, 00bers) and one-hit KO moves on Pokémon NetBattle? Dragon Champion, the dragon trainer? CHAMPION LANCE of Pokémon NetBattle Supremacy's POKéMON LEAGUE server? Dragon Rush Leader LANCE, the DW Ubers/No Preview Ubers/BW2 Ubers player famous for specializing in the use of the Magic Sun strategy? The guy who shamelessly abused SwagPlay in several different metagames before Swagger was banned from them? The man famous for using stall in both eras of Generation VI Übers? LLW, the the legend who peaked the Anything Goes ladder with a 63-1 win-loss record? That "tian long shen" guy who dominated Pokémon Online's ORAS Balanced Hackmons ladder by occupying all five of the top spots, while reaching top 10 on that server's ORAS Hackmons ladder within one week of playing that metagame and peaking it soon after, despite the fact that many other trainers on that ladder spent five months and yet still struggled to reach 1500 points? Or Immanent God LANCE, the one who seemed to effortlessly conquer every Other Metagame he ever bothered to grace? "Übers Legend PTR." "God of Hackmons Lance." "AG Master LLW." Different people throughout different communities have addressed me by those titles many times. But if there existed an objective way to define me as a Pokémon trainer... then what would that be? In truth, I am all of the aforementioned. But in a traditional sense, my main tier was Übers. If one were to step back and look at my Pokémon battling career as a whole, they would notice that throughout the bulk of my time as a Pokémon trainer... I have been an Übers player. This is because traditionally, Übers has been the highest tier in Pokémon - regarded as a banlist rather than an actual tier by some. That is why I have always loved it. The thought of commanding Pokémon of god-like power, such as Kyogre, Groudon, Lugia, Ho-Oh, Mewtwo and Rayquaza... while defeating opponents who utilized equally powerful Pokémon has always made me feel like a grand deity, and given me an unparalleled level of satisfaction, Pokémon battling-wise. Furthermore, it was the tier with the fewest number of rules - the closest one to a metagame in which absolutely everything is allowed, something that greatly appealed to me. Around 2013 however, things changed considerably for both myself as well as the world of competitive Pokémon. As Classic Hackmons (which I did not play until this year, as I was greatly turned off by the idea of Wonder Guard) and Balanced Hackmons became playable metagames on Pokémon Showdown!, I began spending more time playing that metagame, though I never completely abandoned Übers. Despite Übers having traditionally been the highest tier, the amount by which it satisfied my power-loving self was nonetheless insignificant compared to a metagame in which Pokémon can transcend the limits of legality and have 252 EVs in every stat, while having the option of possessing almost any move or Ability their trainer desired... much like some of Lance's Pokémon in the actual games. Then, shortly after Pokémon Omega Ruby and Alpha Sapphire were released... a new tier above Übers was made - Anything Goes. As it was the tier I have always wanted Übers to be, I saw no reason to stay in Übers, and moved on to Anything Goes. But although I moved, others around me did not. Many people, including friends and clanmates of mine apparently loved Übers for reasons different from my own, and thus remained in this tier despite the creation of Anything Goes. This, combined with the fact that I remembered who I was upon participating in several Übers tournaments such as the Ubers Premier League, albeit in past-generation Übers metagames as opposed to ORAS Ubers, resulted in me moving towards a certain direction. At the time when I was contemplating these thoughts, I had reached #1 on 48 different ladders. During that period, I was also thinking to myself that I will, for a complex reason which I don't feel like revealing, turn that 48 into a prettier-looking number before the release of my book, Purity Before Existence. As such, I aimed for two more ladder peaks in order to achieve a grand total of 50. Looking at my most recent ladder peaks around that time, I found that those ladders were mostly Anything Goes as well as several variations of Hackmons on the Pokémon Online server - namely, ORAS Balanced Hackmons, Inverted Balanced Hackmons and ORAS Hackmons. Nothing surprising really, considering most of those were my primary metagames for the ORAS era. The power levels in ORAS Ubers may not be quite as high as those in Anything Goes and especially the Hackmons metagames, but I felt that it would be fitting to end my quest for 50 ladder peaks not in my primary ORAS metagames, but rather in the ORAS version of the tier with which I have traditionally most closely identified. Book Ends are aesthetically awesome in my eyes, after all. And it truly has been a while since my last Übers Rate My Team. 4. Respect points for anyone who successfully identifies the connection between the following three Rate My Team threads of mine: Flames of the Heavenly Light, ☽Mare Tranquillitatis☾ and Gaia☯Force. Gaia☯Force actually began as an XY Ubers team named Ghost Stories, made by a person known as ZoroDark. Somewhere during the XY era, Seele, the leader of the famous Chinese clan CS took that team and replaced Mega Tyranitar with a Judgment/Recover/Stealth Rock/Will-O-Wisp Arceus-Fairy, while making various other small tweaks to it, such as replacing Clefable's Moonblast with Toxic. Finally, I took Seele's version of the team and replaced Arceus's Pixie Plate with a Stone Plate, while making numerous other changes of my own to the team, most notably replacing Giratina's Sleep Talk with Shadow Ball to deal with Taunt Mewtwo. In doing so, I created what I personally believe, even up to this day, to be by far the single best XY Ubers team ever. A few months after I made that team, Pokémon Omega Ruby and Alpha Sapphire were released. As covered at a certain point in my The Master of the Universe [Immanent Being of Thought Mix] Rate My Team thread, whenever I get into a new metagame, the method by which I build my first team very often involves looking back at what gave me success in similar metagames with which I am familiar, and then modifying that team in order to adapt it to the new metagame. Sometimes, this results in a long and slow process in which I gradually tweak the team until it looks nothing like what it started as, as exemplified by the way my BW2 Balanced Hackmons team, Mirages of the Frozen Wasteland, slowly transforming into ☽Mare Tranquillitatis☾ back when I played XY Balanced Hackmons in mid-2014. But other times, the remnants of my old team are still clearly visible in the end product of my new team, such as when I morphed my pre-Swagger ban XY Ubers team In Luck We Trust into my Anything Goes team, In Luck We Trust II [إحْياء من الآس البستوني]. 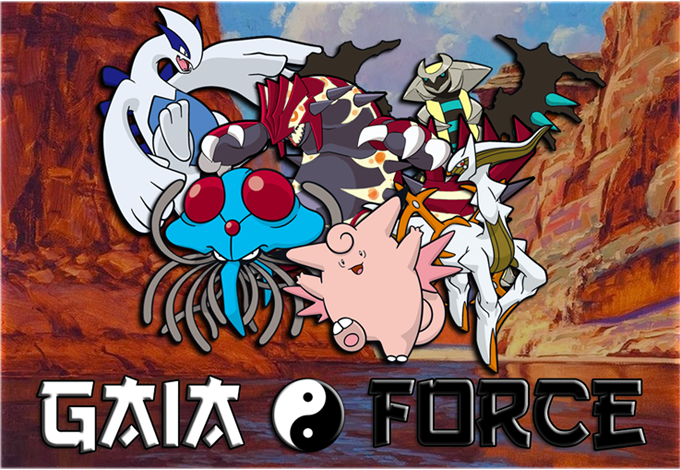 In any case, the first version of Gaia☯Force was quite similar to the team it started as: it retained the Pokémon Clefable, Tentacruel and Arceus-Rock in their exact forms, while also keeping Giratina but changing its moveset to Dragon Tail, Rest, Toxic and Will-O-Wisp in an attempt to adapt to Primal Groudon's overwhelming presence in the ORAS Ubers metagame. The changes I made to the team were replacing Ferrothorn and Kyogre with Lugia and Primal Groudon, respectively. The former had Dragon Tail, Roost, Toxic and Whirlwind, with the first move being used as I was still very paranoid of Taunt users such as Mewtwo and Mega Gengar, since such Pokémon were very dominant in the first half of the Generation V Übers metagame. As for Primal Groudon, I used a moveset I personally invented for it - The Great Pokémon Master's Awakening Infernal Dinosaur, as I believed at the time that it would be perfect for a stall team, especially since my team already had a Stealth Rock user in Arceus-Rock anyway. Sometime early on in the ORAS era, I reached #1 on Pokémon Online's ORAS Ubers ladder with this team. However, I do not consider such an achievement to be reflective of the quality of that team, since it was very early on in the ORAS Ubers metagame back then, and the metagame had yet to become stable. I remember that I later replaced my Arceus's Stone Plate with an Earth Plate, believing that greatly strengthening my team's matchup against the single and by far most dominant Pokémon in the ORAS Ubers metagame was well worth it in exchange for making it weaker to Ho-Oh. However, I replaced my Arceus's Stealth Rock with Stone Edge in order to prevent it from being complete Ho-Oh bait, while at the same time replacing my Primal Groudon's Sleep Talk with Stealth Rock. Simultaneously, I also replaced Lugia's Dragon Tail with Ice Beam upon noticing that Taunt Mewtwo and Mega Gengar were nowhere near as prominent in Übers as they were prior to the release of Pokémon Omega Ruby and Alpha Sapphire. Around this time, the tier Anything Goes was made, so I left ORAS Ubers since Anything Goes "replaced" that metagame for me. As such, for about two years, the evolution of my ORAS Ubers stall team came to a complete halt. However, the time I spent playing Anything Goes indirectly gave me some ideas which I would much later use to perfect my ORAS Ubers team. I noticed an Anything Goes stall team made by a friend of mine known as Sage Hane/hexandwhy. I was inspired to try that team myself, since it was good enough to peak the Anything Goes ladder, after all, while I have had extensive experience using stall in Übers before. As I used that team, I made some changes to it - namely, replacing Darkrai and Arceus-Normal with Tentacruel and Lugia respectively, with the former utilizing the exact same moveset as in my XY and ORAS Ubers stall teams, while the latter shared the same moveset as the Diving Pokémon in my first Anything Goes team, The▲Absolute▲Power▲. Additionally, I also changed Arceus-Steel to a Judgment/Recover/Stealth Rock/Will-O-Wisp set, and replaced Giratina's Will-O-Wisp with Toxic in order to deal with Primal Groudon better. After making such changes to Sage Hane's team, I now had a team with a Rapid Spin Tentacruel and a Defog Giratina. Previously, I had thought that including both of the aforementioned in one team would be a waste of moveslots, but after extensive experience with using that team, I realized that that was not necessarily the case at all, as both moves were useful in different situations - Rapid Spin can be used even while the user is Taunted, and does not remove entry hazards from the user's side of the field, while Defog cannot be blocked by a Ghost-type Pokémon. Additionally, Tentacruel and Giratina both wall and are threatened by different Pokémon, meaning that having both of the aforementioned entry hazard removers in one team gave me far more control over the entry hazards aspect of the game. For example, I can send out Tentacruel to Rapid Spin on a Stealth Rock Arceus-Fairy, or Giratina to Defog against a Primal Groudon while the latter gets worn down by poison damage. Aside from that, I also had another belief of mine changed in using Sage Hane's team: Previously, as demonstrated in this post of mine in Sage Hane's Rate My Team thread, I had believed that Toxic was generally superior to Moonblast on an Unaware Clefable, but I later realized that Moonblast was more helpful in more situations. Finally, although this was already evident to me back when I used The▲Absolute▲Power▲, using my modified version of Sage Hane's team nonetheless reminded me of just how devastating Substitute Lugia can be when used in a team with Toxic Spikes support. Around that time, I went back to play some ORAS Ubers for fun, utilizing this stall team by Exiline, upon hearing that Sage Hane's stall team was originally inspired by that ORAS Ubers team. As Exiline's ORAS Ubers stall team gave birth to Sage Hane's Anything Goes stall team, which in turn gave birth to my own Anything Goes stall team, all three teams shared countless similarities, including the exact same movesets for both Clefable and Ho-Oh. However, in using both my own stall team in Anything Goes and Exiline's team in ORAS Ubers alongside each other, I could not help but notice just how incredibly helpful the Substitute technique of the Lugia in my Anything Goes stall team was, as well as how often I wished the Lugia in Exiline's ORAS Ubers stall team had that move. Substitute was simply amazing not only for its ability to protect the Psychic/Flying-type Pokémon from Leech Seed and status, but also because it allowed Lugia to stall for significantly longer than it normally would be able to, since it is usually able to take a hit and then make a Substitute before Roosting back to full health and reactivating Multiscale instead of having to Roost repeatedly every turn. And the move Roost only has 16 PP, after all. Although in the end, it is completely understandable why an ORAS Ubers stall team would want Ice Beam Lugia far more than an Anything Goes stall team would, since Refresh + Roost Mega Salamence is a massive threat in ORAS Ubers, while Mega Salamence in general is mostly regarded as a Pokémon rarely-used and outclassed by Mega Rayquaza in Anything Goes. Anyway, as mentioned in the introduction of this thread, I eventually reached a point in time where I wanted to peak two more ladders in order to reach a grand total of 50 peaks, and chose ORAS Ubers as the metagame for my final two peaks - one on Pokémon Online and the other on Pokémon Showdown!. I tried the previously-mentioned stall team by Exiline, various teams made by my friend Sandglass/ybss1993, Lord Outrage/Executive Archer's Absolute Control, a Sticky Web team which Astounded/Arsenal regarded as his single best ORAS Ubers team, and these two teams by Lacus Clyne, including a variation of the former made by Mask of the Ice with Ditto over Yveltal. However, none of those teams suited my style at all, so I eventually went back to my first ORAS Ubers team. Applying various pieces of wisdom I gained during my time playing Anything Goes, as explained above, I modified that team, changing Clefable's Toxic to Moonblast, replacing my old Giratina set with the same one used in my Anything Goes stall team, and finally, replacing Lugia's Ice Beam with Substitute as well as Arceus-Ground's Stone Edge with Ice Beam. With these changes, I created a truly excellent as well as by far the most consistently successful ORAS Ubers team I have ever known, with which I achieved a 58-2 win-loss record, as seen on the screenshot above. Named after the Norse Goddess of the Earth, Clefable is this team's Unaware wall, cleric and Wish-passer. With its incredible Ability combined with its EVs as well as the moves Wish and Protect, it can easily counter both Extreme Killer Arceus and Geomancy Xerneas - two of the top sweepers in this metagame. Aside from its obvious utility in conjunction with Wish, Protect also serves numerous other purposes, such as buying the Fairy Pokémon a free round of Leftovers recovery, forcing the opponent to take a free round of burn or poison damage, as well as scouting the attack of Pokémon holding a Choice item, which is especially useful against the ever-common Choice Band Ho-Oh, since the question of whether a user of Gaia☯Force should switch to Lugia or Giratina against that Pokémon depends on which move it chooses to lock itself into. Besides healing itself, Clefable's Wish technique can also be used to heal its teammates, and this is especially beneficial for Tentacruel, which has no healing move of its own, as well as for allowing a user of this team to switch to a damaged Lugia while reactivating its Multiscale on that very same turn. Heal Bell is self-explanatory on a stall team such as this one, especially given it contains two Rest users without Sleep Talk as well as one Pokémon whose Ability is completely ruined by burn or poison. Finally, Moonblast prevents Clefable from being complete Taunt bait, while allowing it to slowly wear down Extreme Killer Arceus and Geomancy Xerneas. Furthermore, this move also threatens Pokémon such as Darkrai, Yveltal and the Giratina Formes. Its EV spread gives it optimal mixed bulk, and credits go to Sage Hane for it. Also, since I am right now talking about a Pokémon that is capable of learning both Aromatherapy and Heal Bell, allow me to share one piece of advice, albeit ORAS Ubers is hardly the metagame in which this is most relevant (but this isn't a metagame-specific advice anyway): If a team's cleric is capable of learning both Aromatherapy and Heal Bell, and one has a Soundproof Pokémon in their team, then of course, one should opt for Aromatherapy. However, if one does not have a Soundproof Pokémon in their team, then one should always use Heal Bell. Why? Because on the chance that the opponent's team contains both a Pokémon with the Imposter Ability and a Pokémon with the Soundproof Ability, and the opponent Imposters one's cleric while their Soundproof Pokémon is afflicted with a status condition, then Heal Bell's very slight advantage over Aromatherapy is clear. And yes, before anyone points it out, I have, admittedly, failed to practice what I am preaching here at one point. Gaia☯Force's second member, named after the Shinto God of the Earth, is one of this team's two entry hazard removers, as well as one of its two entry hazard setters. As a trainer with extensive amounts of experience using stall across numerous different metagames, I must point out how the usefulness of the move Toxic Spikes in this playstyle cannot be understated. Whereas most stall teams, at least in Generation VI metagames, utilize only Stealth Rock as an entry hazard, Gaia☯Force is capable of setting up both Stealth Rock and Toxic Spikes, giving it several huge advantages over the average stall team. Firstly, hyper-offense, one of the most dominant playstyles in ORAS Ubers is a way of battling that follows the philosophy that the best defense is a good offense. In a battle between a hyper-offensive team and a typical stall team in Generation VI, this adage is demonstrated splendidly, as the hyper-offensive team can apply constant pressure against a stall team, forcing its members to heal repeatedly while having almost no time or opportunity to counter-attack, making it only a matter of time before the hyper-offensive team eventually scores the critical hit, freeze, full paralysis, flinch or correct prediction necessary to break the stall team. However, this philosophy completely crumbles to the ground once Toxic Spikes are added to the equation. Because most stall teams do not have this entry hazard, there is usually no telling how long they will need to stall for, giving offensive teams countless chances to break through them. But if the stall team successfully manages to set up Toxic Spikes, a timer is automatically placed upon the lifespan of any offensive Pokémon not immune to it, meaning that the Pokémon in the stall team only need to defend themselves against such offensive Pokémon until the point at which they succumb to the poison. This is particularly important when dealing with Darkrai, which, after putting one Pokémon in a stall team to sleep, usually receives countless opportunities to break stall through any combination of Substitute, Nasty Plot, Dark Pulse flinches or critical hits, Sludge Bomb poisoning or critical hits, Leftovers recovery, as well as the fact that the stall team it faces will be practically missing one member due to it having been put to sleep. However, if the Pitch-Black Pokémon happens to be poisoned upon entry, then the amount of time in which it will be able to wreak havoc in the aforementioned ways will be limited, especially when combined with the Protect of Clefable and Tentacruel, as well as some smart plays such as switching the Fairy-type Pokémon into a predicted Dark Pulse or the Water/Poison-type Pokémon into a predicted Sludge Bomb. Furthermore, to add onto all this, the Substitute Lugia in this team tends to completely walk over hyper-offensive teams once Toxic Spikes are down, at least after the opponent's Darkrai and/or Excadrill is eliminated. Secondly, my experience tells me that in a battle between two stall teams, the one with only Stealth Rock as an entry hazard is at a severe disadvantage against one with Stealth Rock in addition to either Spikes, Toxic Spikes, or both. This is because the stall team with only Stealth Rock as an entry hazard would be the one which needs to use Defog once the battle reaches a point at which all entry hazards are set up, meaning that team team would be placed on the defensive. Additionally, because both Stealth Rock and Toxic Spikes outnumber Defog in terms of PP, if the battle goes on for long enough, the battle would at least theoretically reach a point at which the opponent runs out of Defog PPs, resulting in them losing. This is made further gruelling for the opponent when considering the fact that Gaia☯Force is capable of forcing the opponent to use up two Defog PPs with one use, thanks to Giratina's Pressure Ability, as well as the fact that this team has the potential to remove entry hazards from only its own side of the field thanks to Tentacruel's Rapid Spin. Aside from that, if the Jellyfish Pokémon sets up a layer of Toxic Spikes while the opponent's Defog user is not out, then unless that Defog user happens to be immune to this entry hazard, it is guaranteed to be poisoned the next time it comes in. And considering most Defog users in this metagame happen to be Arceus that have no way of curing its own status condition, as well as how important a Defog user is for preventing a stall team from crumbling, this places great pressure on the opponent, and can potentially force them to eat up their Aromatherapy/Heal Bell PPs very quickly. Besides setting up Toxic Spikes, Tentacruel also serves as Gaia☯Force's secondary switch-in to any variant of Kyogre, as well as the primary switch-in to the Primal form of that Pokémon if it switches into Primal Groudon. In addition to being able to remove entry hazards without also eliminating those on the opponent's side of the field, Rapid Spin also allows the Water/Poison-type Pokémon to clear its own field of entry hazards against Pokémon which Giratina would not be able to do, or at least have a hard time doing, such as Stealth Rock Dialga. Scald is a great move which can pressure the opponent with potential burns, while Protect is used for stalling and scouting, as explained in Clefable's section. With its high special bulk, Tentacruel can also tank the moves of some Pokémon such as Darkrai and support Arceus somewhat. Although this Pokémon technically knows a physical attack in Rapid Spin, I still chose to minimize its Attack IVs since taking minimal damage from Yveltal's Foul Play is very useful in my opinion. Wearing the name of the Roman Goddess of the Earth in this team, the face of the ORAS Ubers metagame itself is Gaia☯Force's third member as well as its Stealth Rock user. Its specially-defensive build allows it to check specially-offensive threats such as Xerneas and Primal Kyogre very effectively, while being able to eliminate the stat boosts of set-up sweepers such as the aforementioned Fairy-type Pokémon with Roar. Additionally, pseudo-Hazing moves are useful in general for teams with more than just Stealth Rock as a damaging entry hazard, which is why this team has three of such moves. Rest is to prevent the Continent Pokémon from being worn down by Stealth Rock, Toxic, Primal Kyogre's Ice Beam and other factors, while as the team's Stealth Rock setter, Primal Groudon's Desolate Land-boosted Lava Plume as well as its potential to burn greatly pressures Defog users. This move also threatens Mega Sableye as well as Steel-type Pokémon such as Klefki and Ferrothorn, which is useful as such Pokémon have the potential stand as great nuisances to this team otherwise. If someone were to ask me what my signature Pokémon in competitive battles is... I would answer "Dragonite," despite the fact that is far from my most commonly-used Pokémon in such battles. The fact that I do not use that Pokémon as often as many would expect is understandable, since most of the metagames I play allow the use of big cover legendary Pokémon, leaving no place for the Dragon Pokémon. However, such an answer on my part comes from neither observation nor experience, but rather from my heart. According to many people I know, mostly but far from exclusively within the Anything Goes community, my signature Pokémon is not Dragonite, albeit it is nonetheless a water-dwelling Flying-type Pokémon in possession of the Multiscale Ability. And when I think about it, the reasons why are obvious. Throughout all the metagames I play in which Über Pokémon are allowed, Lugia is definitely my most commonly-used Über in competitive battles. As a matter of fact, I have never created a single team without Lugia in all of the following metagames: ADV Ubers, BW2 Balanced Hackmons, ORAS Ubers, and Anything Goes. Contrary to what many would expect from a person who uses the Diving Pokémon this often, I have never actually built a team specifically around or for the purpose of actually using Lugia. Rather, the Guardian of the Seas is simply a Pokémon I tend to put in my teams late during the teambuilding process, due to how incredibly useful it is, thanks to its ability to wall large portions of pretty much any metagame in which it is usable. And needless to say, such terrifying defensive power possessed by this legendary Pokémon is once again demonstrated in Gaia☯Force, as it appears for the fifth time in my twelve Rate My Team threads so far, of which two are for metagames in which this Pokémon is not allowed to be used in the first place. Named after the Hindu Goddess of the Earth this time, Lugia utilizing exactly the same moveset as in The▲Absolute▲Power▲ returns in this team, along with its ability to effortlessly counter countless offensive threats in the metagame, including Extreme Killer Arceus, Geomancy Xerneas, Calm Mind Arceus, Swords Dance and/or Rock Polish Primal Groudon, Mega Salamence, Rayquaza, Latios, any variant of Mewtwo without Taunt, and more. Lugia can make two Substitutes before using Roost to restore itself to full health and reactivate Multiscale, which often weakens the opponent's Pokémon's attack enough to allow the Psychic/Flying-type Pokémon to block another attack with Substitute while ending up still healthy enough to reactivate Multiscale once again on the next turn with Roost. In this way, by alternating between Substitute and Roost, the Diving Pokémon can stall the opponent's offensive Pokémon all day, while waiting for it to succumb to poison (either from Tentacruel's Toxic Spikes or the Toxic of this team's Giratina or Lugia), burn and/or Life Orb damage. And if the opponent's offensive Pokémon boosts their offensive stats, Lugia can simply eliminate such stat boosts with a simple Whirlwind, while possibly racking up entry hazard damage on their side. In this game of Pokémon battling, exactly what is it that defines a skilled trainer, or an excellent team? In many multiplayer games, including fighting games and more, success is defined by who you defeat, rather than the number of opponents you defeat. Usually, beating a million randoms consecutively without losing is an insignificant feat compared to achieving victory over a skilled player in a best-of-three or five set, or even in a single match. But does the same philosophy really apply to Pokémon battling, a game which, to be fair, does not really have that high of a skill ceiling compared to many other multiplayer games, and in which almost anyone has the chance to defeat someone else given the right combination of RNG-based luck, luck in the form of team matchups, correct guesses in 50/50 scenarios, and other factors, regardless of the difference in skill? And all of this is not even touching on the possibility that in a single battle between two Pokémon trainers, one of them may simply make the conscious decision to bring a team which has a positive matchup against the one he or she expects his or her opponent to bring, and achieve victory despite the fact that his or her team is in general far worse than his or her opponent's, in respect to the fact that it has far less favorable matchups against the majority of other teams used in the metagame in general. With all of the aforementioned factors in mind, I have long ago realized a certain truth about Pokémon battling, which many people still have yet to catch on to, possibly because acknowledging this truth undermines the "competitiveness" of Pokémon battling in their eyes, something they consciously refuse to do out of their love of this game. Don't get me wrong - Pokémon is a large part of my childhood, and it is a game I will most likely love for the rest of my life. Yet, I am not afraid to face this truth, which in fact is not even that difficult to handle: Success in Pokémon is not determined in a small number of battles, regardless of who the opponents may be. Rather, success is determined by winning consistently over countless battles against innumerable different opponents and teams, even if many of the opponents one defeats may be unskilled, or if their teams may be flawed. From a purely mathematical point of view, in a game as luck-based as Pokémon, the act of defeating a high enough number of opponents of any skill level in a row without losing eventually surpasses the difficulty of defeating the best trainer once. And all of this serves as the foundation stones of the model according to which the quality of a trainer or team is measured. Because luck is such an inextricable part of Pokémon battling, it is not something that can be completely disregarded in teambuilding. It is senseless to completely dismiss a certain victory or defeat as being nothing of importance when it comes to telling how good a trainer or team is just because the outcome of that match was a result of RNG-based luck, more commonly known as "hax." If a person were to participate in ten thousand battles in any metagame, and loses only once to "hax," such a person would be in no position to be complaining about luck ruining what would otherwise be a perfect record. On the contrary, such a person should consider themselves to be extremely lucky that "hax" had not resulted in him or her losing a significantly higher number of battles, regardless of how incredibly skilled he or she may be, since the chances of that not happening are statistically unbelievably low. What I am getting at through explaining all of this is that how "hax-resilient" a team is is an incredibly important, if not possibly the most important factor determining how good a Pokémon team is. "Hax resilience," of course, refers to how much "hax" it would take on average for the team to lose a battle it would otherwise win. For example, in the ORAS Ubers metagame, a team whose primary method of checking Extreme Killer Arceus involves hitting it with Focus Blast would be a team that is very weak in terms of hax resilience. Not only because Extreme Killer Arceus is a very commonly-used Pokémon in this metagame, but also because statistically, if such a team were to face a team containing Extreme Killer Arceus twice, the odds of the Focus Blast team winning both battles is only 49%, without even touching on the possibility that the Focus Blast team loses anyway despite the Fighting-type move hitting Arceus-Normal in both matches, as a result of other factors such as hax happening elsewhere in the battle. In truth, the need to make a team hax-resilient is very similar to the need to have most threats in the metagame covered when teambuilding, despite the fact that the latter is acknowledged far more often than the former. If a certain Pokémon had a usage of, say, 10% in a metagame, people would regard it to be foolish to make a team that automatically loses to that Pokémon, since that would mean automatically losing 10% of one's battles on average. However, by opting to depend on an inaccurate move, one is also automatically losing in many scenarios as a result of that move missing - it's just that such scenarios are more subtle, situational and difficult to identify. A single Pokémon team can only have six Pokémon and twenty four moves - it cannot cover everything. And what many people do not seem to realize when teambuilding is that leaving a team weak to certain uncommon threats in a metagame, in exchange for making it more resilient to hax is actually a perfectly viable way to improve the overall quality of the team, if doing so increases the team's overall chance of winning taking both RNG-based luck and the usage of threats in the metagame into account. The only reason why this is not commonly acknowledged is because victories and defeats whose outcomes are a result of RNG-based luck are often dismissed as meaningless, whereas a trainer losing to a certain threat their team was not prepared for is something more often blamed on that trainer themselves, despite the fact that this should not be the case since both cases are forms of luck, and luck is something that will almost certainly and inevitably even out over a high enough number of battles. With the above philosophy in mind... it should be clear why Gaia☯Force is a team with which I managed to peak the ladder while achieving an amazing win-loss record of 58-2. Imagine if I had instead laddered with one of many other teams in the ORAS Ubers metagame. How many times would I have lost as a result of something like a Precipice Blades miss, a Stone Edge miss, or me using a team that relies on soft-checking Extreme Killer Arceus, only to see that soft-check being knocked out by a +2 Attack critical hit from that Pokémon? All of this goes back to show why Substitute Lugia is so valuable for this team's consistent success. By making Lugia less exposed to factors such as Fire Punch, Lava Plume, Scald or Sacred Fire burns, flinches from moves like Dark Pulse, as well as rendering many potential critical hits irrelevant since they only manage to break a Substitute anyway, Gaia☯Force's chances of losing to hax are reduced significantly. Substitute also eases prediction against faster Pokémon, which can prevent the Psychic/Flying-type Pokémon from wasting Roosts needlessly, since that move only has 16 PP after all. The EVs maximize Lugia's HP, while giving it enough Speed to outrun Pokémon with base 90 Speed provided they do not run a Speed-raising Nature, and the rest of the EVs are thrown into Defense alongside a Bold Nature to give it the best possible mixed bulk. The Altered Forme of the Renegade Pokémon, named after the Egyptian God of the Earth, is a defensive behemoth as well as one of Gaia☯Force's two entry hazard removers. Tentacruel is obviously completely helpless against by far the most common Stealth Rock user in the metagame, Primal Groudon. However, Giratina happens to be able to tank support Primal Groudon's attacks incredibly well while being able to spam Defog against it while Toxic-stalling it. This Giratina's physically-defensive build along with its Rest technique allows it to counter Life Orb Ho-Oh thanks to the sheer amount of recoil that item in combination with Brave Bird places on the Rainbow Pokémon, which forces it to Recover every once in a while. Additionally, Giratina can also tank Choice Band Ho-Oh locked into Earthquake and especially Sacred Fire very comfortably, with Pressure being able to eat away the latter's PPs very quickly. And although the Ghost/Dragon-type Pokémon may not be able to stomach Choice Band Ho-Oh's Brave Birds, Lugia can be switched in to wall those. Toxic also greatly annoys Ho-Oh and many other Pokémon, while Dragon Tail is a very disruptive move which can remove the stat boosts of setup sweepers such as Extreme Killer Arceus, Calm Mind Arceus and Mega Salamence in emergency situations, such as if Lugia's Multiscale is broken, Clefable is weakened, and/or one or both of the aforementioned two Pokémon have fainted. The damage dealt by Dragon Tail, especially against a predicted frail Pokémon such as Mega Gengar or Darkrai switching in, as well as the fact that it can rack up entry hazard damage on the opponent's field is also nice. In battles against other stall teams, Giratina's Pressure Ability is absolutely amazing for wasting the PPs of the opponent's Stealth Rock and Defog techniques. While Stealth Rock is a move that normally outnumbers Defog in terms of PP, the opponent's Stealth Rock will run out of PP before Giratina's Defog does if they are repeatedly forced to set up their Stealth Rock against the Renegade Pokémon. And as for the opponent's Defog, Gaia☯Force is even capable of forcing the opponent to use up three PPs of that move for one PP of Toxic Spikes that Tentacruel uses. How this works is that Tentacruel sets up Toxic Spikes while the opponent switches to their Defog user. On the next turn, Tentacruel uses Protect, while the opponent uses up one PP of Defog. Then on the next turn, Gaia☯Force's user switches to Giratina while the opponent uses up two more PPs of Defog. With its incredible bulk, Leftovers recovery, Pressure as well as Rest, Giratina also makes an awesome status absorber in general for this team. Gaia☯Force's final member is, as expected from an Übers team, an Arceus. Wearing the name of the Greek Goddess of the Earth, this Earth Plate-holding deity is by far the most offensive member in this team. Although, with Gaia☯Force being a stall team, it is not surprising that this Pokémon possesses many defensive properties as well, especially given that it is the Alpha Pokémon. Arceus-Ground possesses the ability to heavily damage two of the most common Stealth Rock users in the metagame - Primal Groudon and Dialga - with its divine signature move, Judgment. Arceus-Ground's presence in this team also differentiates it from many other stall teams in this metagame, namely, in the fact that it is not completely passive against Primal Groudon, being able to hit it hard instead of just relying on poison to wear it down. As a result of this, Gaia☯Force has a far better matchup against offensive Primal Groudon than most stall teams in this metagame do, as it can simply strike it down with a ray of purifying light in an emergency, once it has taken a little bit of damage, possibly from Stealth Rock. This Arceus-Ground also outruns Mega Lucario and can vaporize it with a single super effective Judgment, while its Ice Beam attack shoots Rayquaza and Mega Salamence down from the sky, in addition to being able to deal good damage to Pokémon like Yveltal and Giratina-O. In fact, it is the very presence of Ice Beam Arceus-Ground in this team which prevents it from being easily swept by a Roost + Refresh Mega Salamence when it is the opponent's last Pokémon. In general, the Alpha Pokémon's Same Type Attack Bonus Earth Plate Judgment in combination with Ice Beam gives it great coverage which allows it to hit many Pokémon in the metagame hard. Will-O-Wisp is great for crippling many Pokémon, especially given the fact that by far the most common burn-immune Pokémon in this metagame would not want to stay in against Arceus-Ground. And although Ho-Oh, the second most common burn-immune Pokémon in ORAS Ubers completely walls the Ground-type Pokémon, I still think Will-O-Wisp is better than Toxic, especially since Gaia☯Force already has Toxic Spikes in addition to two other Toxic users anyway, while the team's only other methods of inflicting a burn are with Tentacruel's Scald and Primal Groudon's Lava Plume. Finally, Recover is a self-explanatory move, and I opted for maximum HP and Speed as well as a Timid Nature to increase its mixed bulk while allowing it to Speed-tie with other max. Speed Arceus, which can be helpful for pressuring opposing Defog Arceus with Judgment once they have been poisoned or burned. : Whether or not Groudon may be in its Primal form, Giratina badly poisons it while using Defog to remove any Stealth Rock it sets up. In a long stall war against a Rest Groudon, the opponent's Groudon will run out of Stealth Rock before Giratina runs out of Defog if the latter is switched into the former most of the time while the former sets up that entry hazard, as the Renegade's Pressure Ability will deduct 2 PPs from Groudon's Stealth Rock with each use. Swords Dance and/or Rock Polish Primal Groudon are countered by Lugia, which can take even boosted attacks very well, badly poison the Ground/Fire-type Pokémon, and/or remove its stat boosts with Whirlwind. Arceus-Ground can also heavily damage Primal Groudon with Judgment, if not knock it out after it has been damaged. Specially-offensive Primal Groudon with Eruption, Dragon Pulse and Solar Beam are a massive pain though, just like it is against any stall team, but thankfully it is rare, and Gaia☯Force still handles it decently well due to the presence of Toxic Spikes as well as Arceus-Ground. : Clefable can counter all variants of Xerneas except for Geomancy + Rest and Choice Specs, with the latter being rare but very threatening to this team. However, it can still be played around with a combination of Tentacruel, Lugia and Primal Groudon, depending on which move it locks itself into, especially once it has been burned or poisoned. Any Geomancy Xerneas without Ingrain are countered by Primal Groudon and Lugia, although ones with Block and Rest can be very threatening to this team if they manage to trap Clefable, Tentacruel or Arceus-Ground. : All variants of Extreme Killer Arceus except for Recover ones are countered by Clefable, with the Recover variants still being able to countered by the Fairy Pokémon once it has been burned or poisoned. With that said though, avoid switching Clefable directly into an Extreme Speed, especially a Life Orb one, which can knock the Fairy-type Pokémon out in two hits. Lugia and Giratina can both poison the Alpha Pokémon, tank even boosted hits from it incredibly well, and eliminate its Attack boosts with their pseudo-Hazing moves, while Arceus-Ground can cripple it with a burn. Toxic Spikes also often make life harder for Extreme Killer Arceus, especially the Lum Berry variants. As while Lum Berry Arceus would normally need to be hit twice by any two combination of Toxic and Will-O-Wisp in order to be statused, hitting the Normal-type Pokémon even once with either of the aforementioned moves becomes completely unnecessary after Toxic Spikes are on the field. This is because its Lum Berry is removed the first time it switches in, while it just needs to be pseudo-Hazed once from that point onward, and it will be poisoned the next time it comes in. : Mostly countered by Clefable, while any variant without Life Orb or Black Glasses can be countered, burned and Ice Beam-pressured by Arceus-Ground. Tentacruel can also somewhat comfortably switch into physically-defensive Yveltal, especially after it has been burned by Scald or Arceus-Ground's Will-O-Wisp. : Countered by Lugia, and destroyed by Arceus-Ground's Ice Beam. Giratina can stomach its attacks quite well too, while dealing decent damage to it with Dragon Tail. : When the opponent first sends out a Darkrai, let either Primal Groudon or Arceus-Ground take the Dark Void, depending on which of the two is less useful in the battle judging by Team Preview. However, if Darkrai happens to come in directly against either of them, it's best to just click Lava Plume or Judgment regardless, as there's a 20% chance that Dark Void will miss, resulting in the Pitch-Black Pokémon being hit hard, and possibly even burned on that turn. After that, the Dark-type Pokémon can be beaten by a combination of Clefable's Moonblast, Tentacruel's Scald, and either the Lava Plume of Primal Groudon or the Judgment of Arceus-Ground, depending on which one was not put to sleep. Also, when one sees Darkrai in Team Preview, prioritize getting Toxic Spikes up as soon as possible, as a poisoned Darkrai becomes far, far easier to deal with, especially when combined with Clefable's and Tentacruel's ability to stall it with Protect. After Darkrai has been defeated, Clefable can use Heal Bell to wake up the Pokémon which was put to sleep. : Can be burn/Toxic-stalled to death, and this Pokémon very often finds itself burned by Tentacruel's Scald or Primal Groudon's Lava Plume, due to the number of times it generally switches into them as a result of the fact that the Ghost/Dragon-type Pokémon is usually a Defog user. Giratina-O can also be damaged by Clefable's Moonblast and Arceus-Ground's Ice Beam, while Gaia☯Force's two Ground-type Pokémon are also immune to Thunder Wave, a move Giratina-O very commonly uses. Because of their immunity to Thunder Wave, a Thunder Wave Giratina-O also cannot have its Hex's power doubled against them, at least without the help of a teammate. Combining this with Arceus-Ground's ability to tank the Renegade Pokémon's Draco Meteor very well, it becomes clear that the Ground-type Alpha Pokémon is pretty much a hard-counter to Thunder Wave + Hex Giratina-O. Toxic + Hex Giratina-O are a bit more annoying, but Tentacruel serves as an immunity to poison, while its great special bulk lets it tank Giratina-O's attacks somewhat. Physically-offensive Giratina-O are also generally countered by Arceus-Ground. : Any Ho-Oh without Choice Band or Life Orb is hard-countered by Giratina, while the Renegade Pokémon can still deal with the Life Orb variant somewhat thanks to its lower damage output compared to Choice Band Ho-Oh, as well as the sheer amount of recoil the Rainbow Pokémon will be suffering, forcing it to Recover every now and then. Choice Band Ho-Oh can be troublesome, but it can generally be played around with a combination of Gaia☯Force's two Protect users; Lugia's ability to tank Brave Birds and use Substitute to scout Sacred Fires while at the same time wasting that move's PP, hope for a miss to stall further and protect itself from burns on that turn; Giratina's ability to easily switch into Sacred Fire while being able to tank Brave Birds somewhat and use its Pressure Ability to eat up the PPs of both moves; and Primal Groudon serving as an additional Sacred Fire resist. Toxic and especially Stealth Rock also pressure the Fire/Flying-type Pokémon greatly, although keeping the latter down against a team built around Ho-Oh can be difficult. It should be noted that once Ho-Oh runs out of Sacred Fire PPs, Lugia can wall it easily, while Giratina walls it easily once it runs out of Brave Bird PPs. Depending on the team matchup and situation, one should also not be afraid to risk getting Lugia burned by Sacred Fire, since that status effect can easily be cured by Clefable's Heal Bell anyway. : Gaia☯Force contains Primal Groudon as a primary switch-in to this Pokémon, Tentacruel as a secondary switch-in, and Lugia and Giratina as tertiary switch-ins. Non-Rest Kyogre of any kind are easily burn/poison-stalled to death, while variants with Rest are non-threatening to this team, and often bait for both of Gaia☯Force's entry hazard setters. : One of the more threatening Pokémon to this team, due to the fact that its very presence pretty much prevents Gaia☯Force from utilizing its Clefable until the Ghost/Poison-type Pokémon has been knocked out, combined with its ability to easily absorb Tentacruel's Toxic Spikes. Either way, since only Giratina in this team can switch out against it, there's not much to say except to simply attack it with whatever it traps, while avoiding sending out Clefable until Mega Gengar has fainted. Tentacruel's Scald deals decent damage to the Shadow Pokémon, while scoring a burn on it is always sweet. Primal Groudon's Lava Plume and especially Arceus-Ground's Judgment threaten it massively, though attacking it in any way usually comes with the cost of that Pokémon's life thanks to Destiny Bond. And with all of that said, when attacking Mega Gengar, watch out for Disable if they are running a Perish Song set. Giratina cannot be trapped, while Lugia can Whirlwind the Ghost/Poison-type Pokémon away provided it does not carry the rare Taunt. : Primal Groudon, Giratina and Arceus-Ground can all take even a Life Orb-boosted hit from it before retaliating with an attack which knocks it out in a single hit unless it holds Focus Sash, or even if it holds a Focus Sash if Primal Groudon's Lava Plume happens to burn it. With that said though, Life Orb Deoxys-A is definitely very threatening if it comes into this team with Stealth Rock down. One way to play around it is to switch Tentacruel into a predicted Ice Beam aimed at a weakened Arceus-Ground, before switching Lugia into a predicted Psycho Boost, at which point the Diving Pokémon can wall it quite comfortably. Life Orb Deoxys-A that run Knock Off instead of Ice Beam can deprive Lugia of its Leftovers, but the Psychic/Flying-type Pokémon can simply Life Orb-stall it. : Countered by Lugia, and destroyed by Arceus-Ground's Ice Beam. If it lacks Draco Meteor, Giratina can stomach its attacks quite well too, while dealing decent damage to it with Dragon Tail. : Calm Mind variants can be burned/poisoned and then stalled to death by Clefable. The Swords Dance variant on the other hand, can be very threatening to this team, but they tend to lack recovery and usually succumb to poison/burn eventually. Swords Dance Arceus-Ghost can be countered by Clefable if it happens to be burned, and Lugia can also deal with it somewhat, especially if the Ghost-type Alpha Pokémon happens to come in while Lugia is already on the field, Arceus-Ghost lacks Shadow Claw, and/or if Toxic Spikes are down. : As amazing as it may be, this Pokémon's usefulness is limited to fighting offensive teams. It cannot do a single thing to threaten a stall team such as Gaia☯Force, and it is setup/Rapid Spin bait for Tentacruel. : Hates poison and especially burn, the latter being a status effect which Arceus-Ground can easily inflict upon it while outrunning it. Giratina also mostly counters this Pokémon, and even prevents it from gaining Power-Up Punch boosts. If Mega Kangaskhan happens to attain Power-Up Punch boosts but gets burned, it can be burn-stalled to death by Clefable. : Tentacruel is immune to Toxic, resists Play Rough, does not mind Thunder Wave much, and can Rapid Spin away the Spikes it sets up while setting up Toxic Spikes on it and fishing for Scald burns. Giratina can Defog away Klefki's Spikes if need be, and Primal Groudon and Arceus-Ground both knock out the Key Ring Pokémon in one hit. Clefable can remove any status effects the Steel/Fairy-type Pokémon spreads. : Tentacruel takes its attacks very well while being immune to Toxic, and it can set up Toxic Spikes on it and fish for Scald burns against it. Primal Groudon and Arceus-Ground both threaten the Royal Sword Pokémon a lot. : The Swords Dance set can be played around with a combination of Lugia, Giratina and the Will-O-Wisp of Gaia☯Force's own Arceus-Ground, while the Calm Mind set is stalled by Clefable once it has been statused, and support variants are non-threatening to this team. : Tentacruel can take its attacks quite well thanks to its great special bulk combined with Dialga's tendency to lower its own Special Attack with Draco Meteor. At the same time, the Jellyfish Pokémon can Rapid Spin away the Temporal Pokémon's Stealth Rock, set up Toxic Spikes on it, and/or fish for Scald burns on it. Arceus-Ground also threatens Dialga, and Lugia can stall it to death after it has been burned. : Countered by Arceus-Ground, and due to the threat of Tentacruel's Toxic Spikes, Mega Diancie sometimes finds itself worn down and even burned by Scalds on the switch. And if Mega Diancie does not switch into Tentacruel to reflect Toxic Spikes, there is a chance that it may get poisoned the next time it switches in. Any layers of Toxic Spikes it successfully reflects can easily be absorbed or Rapid Spun away by Tentacruel itself. : Primal Groudon threatens to incinerate it, while Tentacruel and Giratina can remove the entry hazards it sets up, with the former also being able to try burning it with Scald. Arceus-Ground can burn the Grass/Steel-type Pokémon with Will-O-Wisp, and once it has been burned, it can be stalled to death by Substitute Lugia if need be. : Setup/Rapid Spin bait for Tentacruel, while it cannot do much to Primal Groudon or Giratina except Ice Beam and Toxic, but both know Rest, and Giratina can also Toxic Arceus-Water back, something the Alpha Pokémon hardly appreciates as it cannot cure its own status. : Mostly countered by Lugia, and Arceus-Ground can also deal with it using Will-O-Wisp and Ice Beam if it lacks Grass Knot. : Whenever a user of Gaia☯Force sees Deoxys-S in Team Preview, they should lead with Tentacruel, and Scald the DNA Pokémon on turn 1, since it almost always starts off with Taunt against Tentacruel, as Toxic Spikes are extremely debilitating for the type of team Deoxys-S finds itself in. If the Psychic-type Pokémon gets burned, great, but either way, spam Rapid Spin after that. Once Taunt wears off, it is time to play some 50/50 mindgames against Deoxys-S by choosing between Scald and Toxic Spikes. The ideal situation would be to have Toxic Spikes on the opponent's field and Stealth Rock off one's own field at the time when Deoxys-S faints, although either both sides having entry hazards on their field, or both sides of the field being clear of entry hazards is fine too, generally, from my experience against hyper-offense. : Just like in Darkrai's case, try to get Toxic Spikes on the field before Mewtwo comes in, as that makes life a lot easier against it. Even if Mewtwo switches in on the turn when Tentacruel uses Toxic Spikes, do not fret, as it can be pseudo-Hazed away so that it gets poisoned the next time it comes in. Mega Mewtwo X generally cannot do much to Giratina, and although specially-offensive variants are much more threatening to this team, they can still be played around with a combination of burn/poison, Lugia, Giratina's Dragon Tail, as well as the attacks of Primal Groudon and Arceus-Ground. The variants with both Taunt and Calm Mind are a nightmare, however. : Countered by Lugia, although the Diving Pokémon cannot do much back to it even with the help of this team's entry hazards. Giratina can chip the Aura Pokémon with Dragon Tail, although it takes heavy damage from Iron Tail, especially Swords Dance-boosted ones. Primal Groudon and Arceus-Ground can both knock Mega Lucario out in one hit, with the former outrunning it, but neither appreciates switching in. Overall, this team does not have much trouble with Mega Lucario though, as Lugia can simply Whirlwind it away and rack up entry hazard damage on its teammates until late in the battle, at which point Arceus-Ground can simply obliterate the Fighting/Steel-type Pokémon with Judgment. : Just like Lugia, this Pokémon cannot so much against a stall team, except maybe Imposter Clefable and then use Heal Bell. : Countered by Primal Groudon. : Calm Mind variants are statused and then stalled by Clefable, while support variants are non-threatening to this team. : Arceus-Ground can tank its attacks while outrunning it and knocking it out in one hit. Giratina can block its Rapid Spin if necessary. La.Melle2402, Moony, Velvet Blood and 9 others like this. Connection between your three rmt threads: the 9463838373 words you put before you say anything about your team. チャンピオンワタル and willdbeast like this. Also the fact that a great many of the Pokemon are nicknamed after various deities for the aforementioned cosmic triad. On reflection every team has a nickname of a deity from each of the same six religions/cultures, namely: Roman, Greek, Hindu, Shinto, Norse, Egyptian. I personally want to know about your 2 losses. What won vs this & if it wasn't RNG related, did you change anything after those losses? 1) It seems rest Primal Kyogre cannot do much to ur team, as u can tank hit with a lot of ur mons; however, the thing is, u simply cant kill it. I accidentally got into a battle with this team using a rest calm mind kyogre, and all u can do is hit it with clefable and wait till it uses rest, and then send out primal groudon to roar it out. 2) Apparently Mgengar is a huge problem. Giratina doesn't like to get hit by shadow ball/hex, and other stuff may be vulnerable to taunt+perish song or taunt+dbond. Paired with a wall-breaker that demands certain member to tank its hit, mgengar played in the right way is just devastating. also, choice Y god can 2HKO clefable if it is chipp damaged enough, a bit more than stealth rock since u can protect one turn. and it apparently at most 2HKO every thing else with dark pulse. Hi fsk, thanks for the rate. This team is very similar to my Anything Goes stall team (which has a name - 天下無敵), and in fact, the Clefable, Tentacruel, Lugia and Giratina in both teams happen to utilize the exact same movesets, with the only difference being that 天下無敵 has Ho-Oh and Arceus-Steel over Primal Groudon and Arceus-Ground. However, they are not the same team despite their similarities, and in fact do not even have the same origins. If you read the end of the "Team building process" section, you will notice that I talked about both teams and how they were made. 天下無敵 is a modification of another Anything Goes stall team made by someone known as Sage Hane, while that team was in turn a modification of an ORAS Ubers stall team made by someone known as Exiline. Gaia☯Force, on the other hand, is a modification of my own XY Ubers stall team, which was a modified version of an XY Ubers stall team made by Seele, with that team in turn being a modification of a team made by ZoroDark. And the funny thing is, despite the fact that both Gaia☯Force and 天下無敵 are usable in both ORAS Ubers and Anything Goes, both teams would be significantly worse if they were to be used in the tier they are not made for. If Gaia☯Force was used in Anything Goes, it would get completely destroyed by Darkrai, while having no switch-in whatsoever to Choice Band Mega Rayquaza. On the other hand, if 天下無敵 was used in ORAS Ubers, it would be less consistently successful than in Anything Goes due to the far greater prevalence of Primal Kyogre and offensive Primal Groudon (which isn't used as much in Anything Goes due to competition from Mega Rayquaza and offensive Arceus in a metagame without Species Clause). Also, yeah, the team can't kill Rest Primal Kyogre, but this isn't such a bad thing for a stall team. You just need to PP stall it while possibly using entry hazards + pseudo-Hazing to damage its teammates. It's like my Substitute Lugia VS. Ferrothorn when the opponent has entry hazards on their side of the field. The fact that Lugia can't touch Ferrothorn doesn't really matter when Ferrothorn cannot do anything back, and Lugia can Whirlwind Ferrothorn away and damage its teammates with entry hazards. I do see the weakness to Mega Gengar and Yveltal though, although such weaknesses are present in pretty much all stall teams in this metagame. The first loss was to a Will-O-Wisp miss on a Cloyster on the turn it Shell Smashed, while the second was because I had underestimated Life Orb Excadrill's damage output on my Arceus-Ground, and had it outrun and knocked out by a +2 Earthquake in a sandstorm summoned by a Mega Tyranitar. La.Melle2402 and fsk like this.